Andrew Cohen considers himself lucky— he had a job throughout the recession and his household income now tops $100,000 a year. Yet when he turns on the news and hears President Obama touting a strong and improving economy, he doesn't buy it. Cohen lives just outside of Cincinnati in northern Kentucky with his wife and two young children. His income from working as a client service manager administering employee benefit plans puts him at more than twice the annual U.S. median income of $53,046. The president is spending more and more of his time of late challenging those doubts, trying to boost consumer confidence and, of course, his party’s prospects in what is expected to be a difficult midterm election year. With five consecutive months of job growth over 200,000, Obama finally has a basketful of better statistics to support his cheerleading. According to the Bureau of Labor Statistics, employers added 288,000 jobs in June, and the unemployment rate dropped to 6.1 percent, the lowest rate since September 2008. Financial markets—and investors’ 401(K)s —have also had a good run. But for many Americans—even Obama supporters like Cohen—the psychology of the economy trumps the statistics. Disappointment and disgust with Washington dysfunction also makes it harder for the president to break through. Years of unfulfilled promises have taken their toll on the public’s perception of the federal government, said economist Douglas Holtz-Eakin, president of the American Action Forum. “[The American people] have been told that everything creates jobs and they no longer believe anything. So when the president says, ‘I’ll do X, Y, or Z and it will create jobs,’ people just tune it out. They’ve heard that all too much,” said Holtz-Eakin, who formerly served as director of the Congressional Budget Office and chief economist of the Council of Economic Advisers under George W. Bush. To be sure, economic confidence is up from the worst of the recession, but it’s not growing as quickly as the economy itself according to Gallup's U.S. Economic Confidence Index, which measures Americans' views of the current economic situation and their perceptions of its future direction. 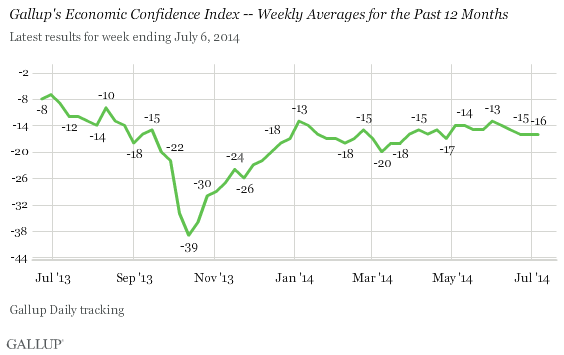 Gallup’s latest finding showed economic confidence dipping slightly in June to -15 from -14 the previous month. For most of 2014, the index has mostly flat lined, hovering around -15. Margie Omero, managing director of Purple Insights at Purple Strategies, a bipartisan public affairs firm, says Americans acknowledge things have come back considerably from the 2008 crash but many are still holding back. Cohen is a case study of that caution—more inclined to save, when possible, than go on shopping sprees. Holtz-Eakin says some of President Obama’s challenge is rooted in history. But he also sees a policy disconnect. “[President Obama] is not on the same page with the vast majority of Americans on what will work,” argues Holtz-Eakin. At this point, though, it’s really not clear whether any policy proposals can dent the shell of protective pessimism that voters like Cohen have built around themselves. Even the undisputed fact that the economy added well over a million jobs in the first half of the year isn’t really getting through.